I made these for book club tonight. 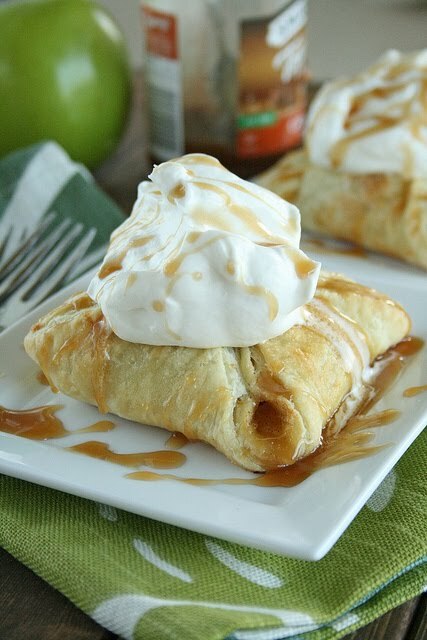 They taste like tiny little apple pies, but are so much easier & faster to make! And a bonus...they look fancy schmancy too. 2. In a sauce pan, melt butter over medium heat. Add the diced apple, cinnamon, brown sugar & salt and cook for 6-7 minutes until the apple is tender. 3. Meanwhile, spread some flour on your work surface and roll the puff pastry into a 10-inch square. Cut this square into four smaller squares. 4. Divide the apple mixture evenly among the squares. Pinch opposite corners closed and crimp all edges between two forks. 5. Brush with egg wash and sprinkle with sugar. Bake for 15 minutes until golden brown. 6. While the apple puffs are baking, combine ingredients for whipped cream in a mixer and beat until stiff. 7. Serve while still warm with a dollop of cream & a drizzle of caramel. YUM! 1. Place all ingredients in a rice cooker, or medium-sized pot if cooking on the stove top. 2. Season with salt to taste after rice has cooked. Of all the recipes I tried that night, this one is the winner thanks to All Recipes.com. It's a perfect bread to sop up all that yummy sauce from the chicken and lentils! This was the one thing my kids liked, probably because it tastes like a cross between a pita and garlic bread. Punch down dough, and knead in granulated garlic. Pinch off small handfuls of dough about the size of a golf ball. Roll into balls, and place on a tray. Cover with a towel, and allow to rise until doubled in size, about 30 minutes. During the second rising, preheat griddle to medium-high heat. Combine melted butter with minced garlic. You will brush this onto the naan as it cooks. Roll one ball of dough out into a thin circle. Place dough on lightly oiled griddle, and cook for 2 to 3 minutes, or until puffy and lightly browned. Brush uncooked side with butter, and turn over. Brush cooked side with butter, and cook until browned, another 2 to 4 minutes. 1. Saute onion in butter until tender. 2. Add lentils and cover with water. 3. Add tumeric, cayenne, cumin & salt and bring to a boil. Simmer and cook until lentils are tender (you may have to add more water). 3. Stir in cilantro and lemon juice. I was in the mood for Indian food a couple weeks ago so I decided to give it a go. Too bad my kids didn't like any of it. 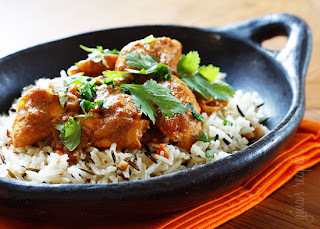 On the other hand, the hubby and I were pleasantly surprised at my first-attempts at Indian. I took this recipe and added some more spice (you know I like it spicy). 1. Saute the onions in butter until golden. 2. Add the crushed ginger, stir for a few minutes then add the garlic and cook another minute. 3. Add cumin, garam masala, turmeric, chili powder, cayenne, and salt; mix well until fragrant, about 2 minutes.